“99.9% it’s not malignant” The radiologist assured me. When I received the biopsy results that had been taken ‘just in case’, I fainted on the spot. Living an idyllic life as a young American couple in Neve Yaakov, on the outskirts of Yerushalayim, this was the furthest thing from my mind. It was the big bad C word, and a bigger nightmare than I could have ever imagined. My mind was racing. How are we going to get through this? Will I survive? What about my husband and children? The first thing I knew was that we couldn’t do this on our own. And I knew who to call. 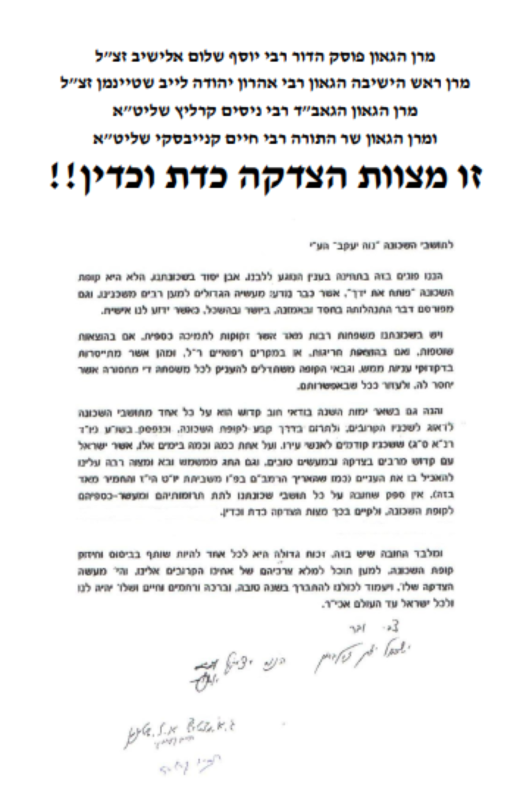 A short while earlier, I had been contacted by Poseach Es Yadecha, our local Tzedakah, enquiring about one of my neighbors. I couldn’t get over how diligent and caring they were, researching whether the family was struggling, especially since this was a Chashuv person on the line and it was clear that he was driven by pure kindness and compassion. Poseach Es Yadecha literally saved us. Treatment was a horrific, long rollercoaster and as much as they would have liked to, our parents couldn’t fly over for extended periods of time. My husband tried his best juggling the home, work, children and taking care of me, but could have never done it without Poseach’s help. They did everything to ensure that our home would run smoothly and the children should not feel neglected, from meals, laundry, childcare, homework and even paying the grocery bill when we were drowning in medical expenses. And they do this for so many families each month. Like the neighbor on bedrest for twins, whose pregnancy was so precarious, every movement was dangerous. The house was flying until Poseach stepped in. And it didn’t end so quickly either. Bringing home twins born 3 months early (after months in the NICU) was scary beyond words. The house became an infirmary. The mother now stays home since the preemies can’t go out to childcare because their lungs are so delicate and can’t be exposed to germs. The stress and trauma of it all would be hard enough, but on top of that, they are also struggling with the loss of the income. Then there are those who need even more long term support. Take the mother struggling with mental illness. Anxiety reigns and fears paralyze her. The kids are acting out and bedwetting. The house falls apart. But kids deserve functionality. They need schoolbooks, homework, clean clothes, and nourishing food, and now they also need Pesach. I have never seen anything quite like it. 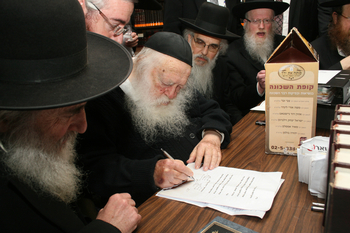 Founded in 1985 by Rav Dovid Kaplan shlita, Poseach Es Yadecha is run by the kind of people who will take their shirt off their backs to help you. Super dedicated, high energy, compassionate Baalei Chessed. It is not just a community fund, they go the whole nine yards, taking care of people in need from A to Z and most importantly working to break the cycle of poverty and rehabilitate. Although on the periphery of Jerusalem, Neve Yaakov is a Torah empire, comprising of 4,500 families and a treasure trove of talmidei chachamim. Unfortunately, it is also home to many struggling families and when it comes to Pesach, the mere thought of how they are going to put food on the Yom Tov table is daunting. None suffer more than the children. Their home lives are fraught with stress and tension. Outside with their friends is no escape. She wears no flower-bedecked hairband; his shoes have very obvious holes. Shame, pain and suffering accompany them wherever they go. Poseach Es Yadecha is truly their only hope. Poseach partners with Malbushai Kavod to provide beautiful clothing at rock-bottom prices. They offer cost-price Matzos, chicken, wine, disposables and dry goods, saving millions of shekels for low income families. They give discreet financial aid to families in crisis, saving them from falling apart. If any of you are looking to give where it is really needed, this is the place. Every dollar you donate will go directly for Yom Tov basics. It’s 100% Kimcha Depischa. 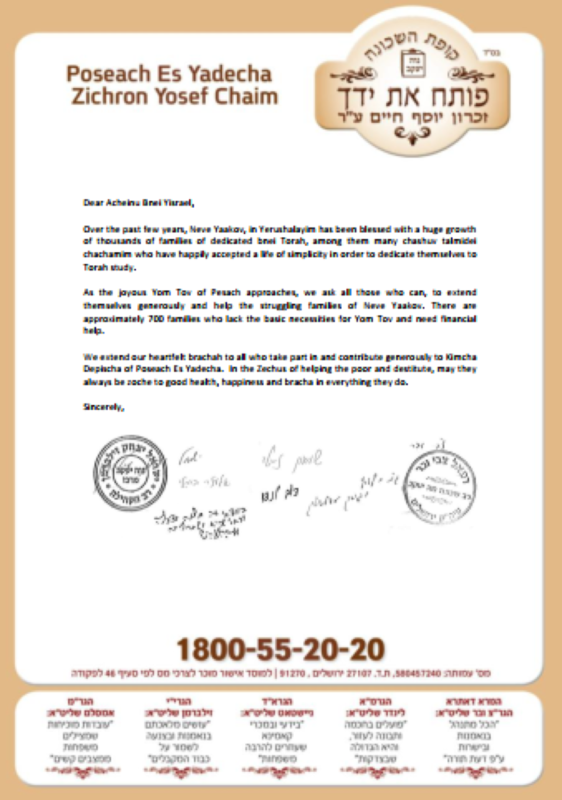 There are 694 families in Neve Yaakov who need your help this Pesach. They are your brothers and sisters too. Please, hear their silent suffering and give them a Pesach of joy. Poseach Es Yadecha is guided by local rabbonim who are personally aware of the details of the sensitive needs of the local residents. The fund is overseen by registered accountants and lawyers as well as recognized in Israel as a chapter 46 registered NGO and in the US as a 501 (c) 3.